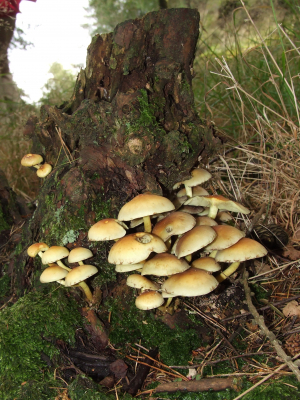 Observation - Hypholoma fasciculare - UK and Ireland. Description: Cap smooth, orange-buff in centre to cream at margins. Gills and stipe creamy yellow. Gills equal length and medium spaced. Stipe scaley. Growing on dense clusters at base of damp, mossy, tree stump. Cap smooth, orange-buff in centre to cream at margins. Gills and stipe creamy yellow. Gills equal length and medium spaced. Stipe scaley. Growing on dense clusters at base of damp, mossy, tree stump.